Get Ready For The Snack Attacks! With this Single Sided 2ft. 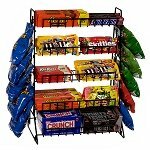 Black Candy Rack you have the perfect setting to showcase all those delicious snack time goodies. Receive the L-style legs, the four various sized metal shelves and eight, six inch peg hooks for your convenience of set-up and display needs. Bags of chips, popcorn, trail mixes and all the wonderful tasting treats are going to be the center of attention on this marketing stage. Hang from the hooks peg bagged style sweets, place on the shelves boxed merchandise like candy bars, gum packets, canned beverages to display for a maximum impact. 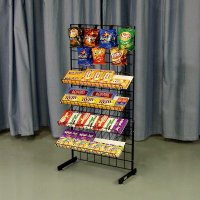 Create the perfect impulse rack and have a one stop shopping area in your convenience store, cafe and snack bar or the waiting area of your service department. The choice is yours so go ahead and invest in the future of your business. Order your black metal candy rack today!